Few products the last few years can show the same phenomenal growth rate as the iPod. The PR success of this tiny gadget is demonstrated over and over again, yesterday in an article in the Norwegian marketing publication Propaganda. They write about a media analysis by media monitoring company Retriever which shows the brands with most publicity in Norwegian media during 2004. The iPod is on top, ahead of older brands like McDonald’s, Playstation and Nokia. 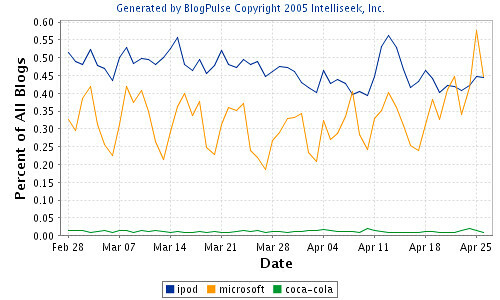 If we look at the number of times the iPod have been mentioned in the blogosphere, the numbers are equally impressive. For example, iPod comes out on top ahead of the world’s number one and two most valuable brands Coca-Cola and Microsoft. The iPod is talked about in half a percent of all blogs and since Blogpulse tracks 10 million blogs, that means that 50,000 blogs talk about the iPod every day. If that’s not a PR success, I don’t know what is.